NMWA visitors don’t have to wait to for glimpses of the museum’s next big exhibition! Though Picturing Mary: Woman, Mother, Idea is still a few weeks away, NMWA has begun unveiling an online preview of the artworks featured. MapHook, a location-based journal and social networking application, is an interactive map that invites viewers to get a first look at the artworks making their way to NMWA from all over the world. Each week, a new set of images is being released, corresponding to one of the six key themes from the exhibition. There are a number of ways to use this new program. Clicking “animation” leads you on a tour around the countries the art is coming from; clicking a flagged pin location on the map, or the artwork itself, will also lead to a screen highlighting that work. When an image is selected, it reveals key details: creator’s name, the date, and the medium. It even displays the lending institution and other artworks from the same institution when applicable. When selecting an artwork from the map, you may notice the “learn more” tab under each thumbnail. Clicking this leads to a full, larger view of the image with more factual tidbits, such as cultural symbols or legends that appear in the pieces. These illuminate the facets of Mary represented in the exhibition. 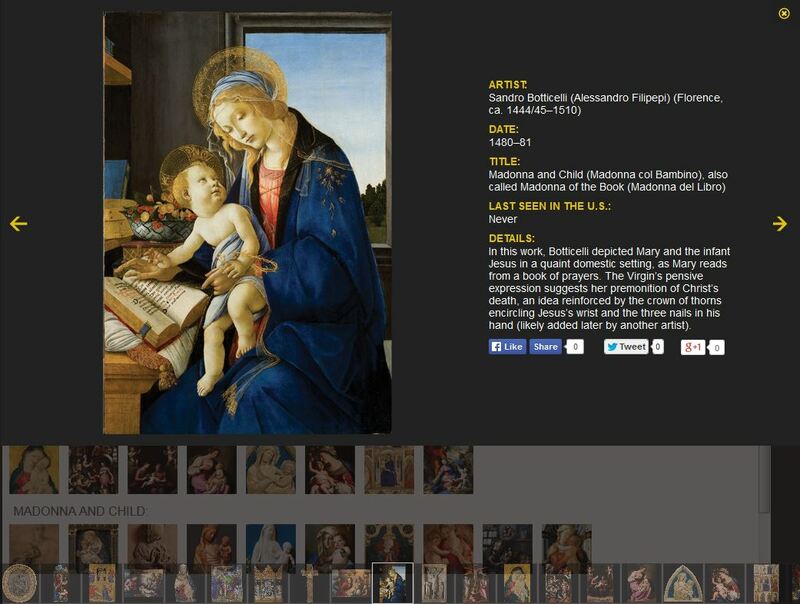 This feature also reveals the last time the artwork was seen in the U.S. For example, over half of the artworks in the first week’s section, which focused on Madonna and Child images, have never been seen before in the U.S. The map is a visual demonstration of relationships created between artworks: several are housed in the same museums or are coming from the same cities. The map also shows the far reach of the image of Mary and NMWA’s exhibition. While several artworks are clustered in Florence, some are as close to home as D.C. itself. The interactive map anticipates the exhibition, which explores the prevalence and popularity of Marian images throughout the Renaissance and Baroque periods, spread across countries, cities, and time. Picturing Mary: Woman, Mother, Idea will be on view December 5, 2014–April 12, 2015. Check every week for MapHook updates, and follow our #MeetMary tag on Twitter and Facebook!